Connie Crosby: Where's Connie? Catching you up on my recent activities! Where's Connie? Catching you up on my recent activities! I sometimes get caught up in projects and neglect to update you, my loyal readers, on just what I'm up to. Here therefore is a list of some of my recent activities for your perusing pleasure! I am delighted to be one of the administrators of the CALL 2006 blog, the first ever blog for a CALL conference. Michael Lines has done a fantastic job creating it--doing both technical and design work. Steve Matthews has given great technical support. Every now in then I throw in some moral support. If you will be attending the conference and would like to join us in blogging it, let one of us know. Otherwise, I hope you will read along. And we strongly encourage comments! I've been included as a panelist in the pre-conference workshop on Knowledge Management for the CALL 2006 conference. I will be representing the KM novice who has been avidly watching from the sidelines and who is going to start out by doing KM on an informal basis. We have a spectrum of librarians-who-do-KM so I hope you will consider attending this day-long session. My latest column on LLRX came out last week, this one on podcasting. Are You Ready for Podcasting? features an interview with Jim Milles. For all of my columns to date, check out The Tao of Law Librarianship on LLRX.com . I have had a great time as "Canadian Correspondent" on Jim Milles' podcast Check This Out! Most recently we taped my interview with Jim for the LLRX column, and he has posted the entire interview in Episode 17. This has prompted a friend to ask, "is that all you guys do, interview each other?" Which caused me to explain to him that what we are REALLY doing is creating some synergy and building expertise. Ahem--there is a difference! 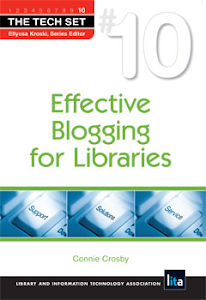 Sabrina Pacifici and I will be running a full-day pre-conference workshop on blogging for the enterprise at SLA 2006 on June 10th in Baltimore. We are looking to make this a true workshop, allowing participants to work through ideas to help everyone already familiar with blogging to "push the envelope". Work on the Northeast Regional Law Libraries meeting to be held in Toronto October 17-20, 2007 has been heating up! I am co-chairing this conference with Stephen Weiter. We are close to having a preliminary website to give everyone some initial information and which will reveal our fantastic team putting this all together. Our theme has been confirmed as "Libraries Without Borders 2" playing on the title used at the last meeting held way back in 1996. If you have any questions about this, feel free to contact me at connieblog@sympatico.ca -- put "NE2007" in the subject line. And despite all these projects and exciting accomplishments, the thing that still gave me the biggest thrill was getting a nod from vlog Rocketboom on March 23rd when they used one of my story ideas again. Woohoo! ...not to mention committee work for CALL and TALL, projects in progress which I can't yet disclose and--oh yeah!--my day job.